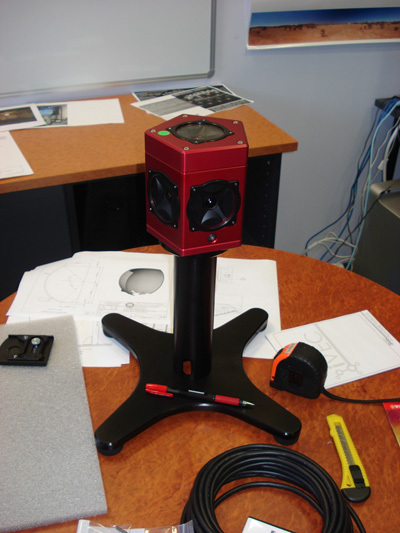 The LadyBug cameras by PtGrey Research have been through three iterations, the original LadyBug, LadyBug-2, and at the time of writing the LadyBug-3. Each consists of 6 cameras in a small unit (in order to reduce parallax errors). 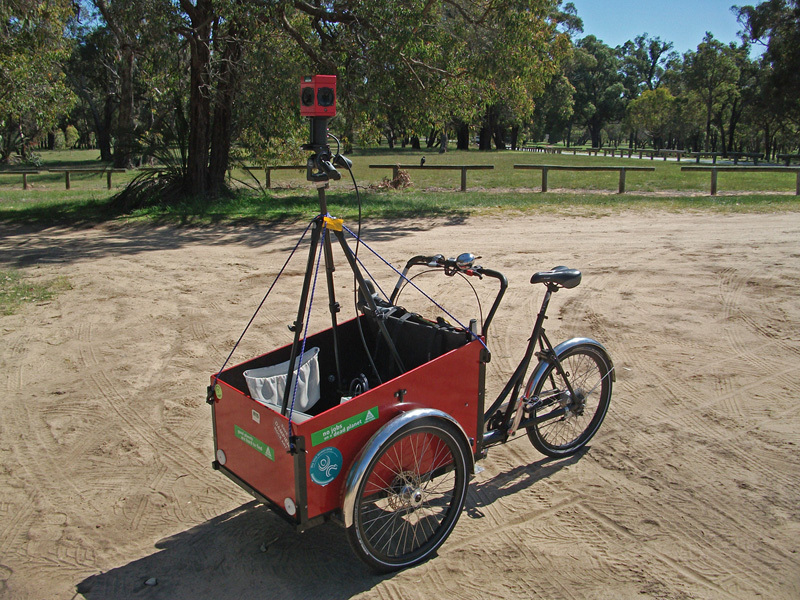 The LadyBug-2 cameras were 1024x768 each and the unit could capture 3500x1750 spherical panoramic images at 30fps. 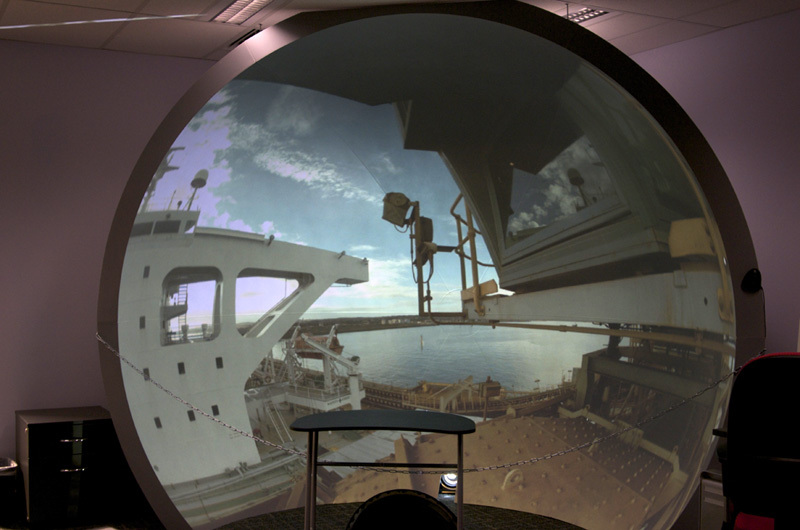 These spherical panoramic images could be presented in realtime in the iDome say or a fisheye could be extracted for a standard non-navigable planetarium style environment. 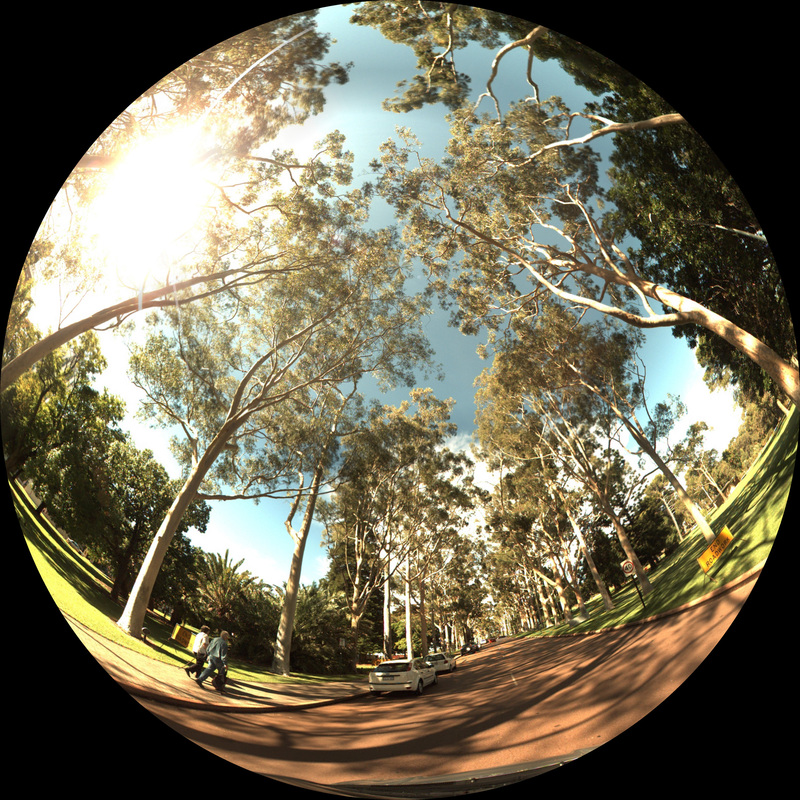 The LadyBug-3 is a somewhat more "substantial" unit, each camera is 1600x1200 and the total spherical resolution is around 5400x2700 pixels. The maximum frame rate is 16 frames per second. 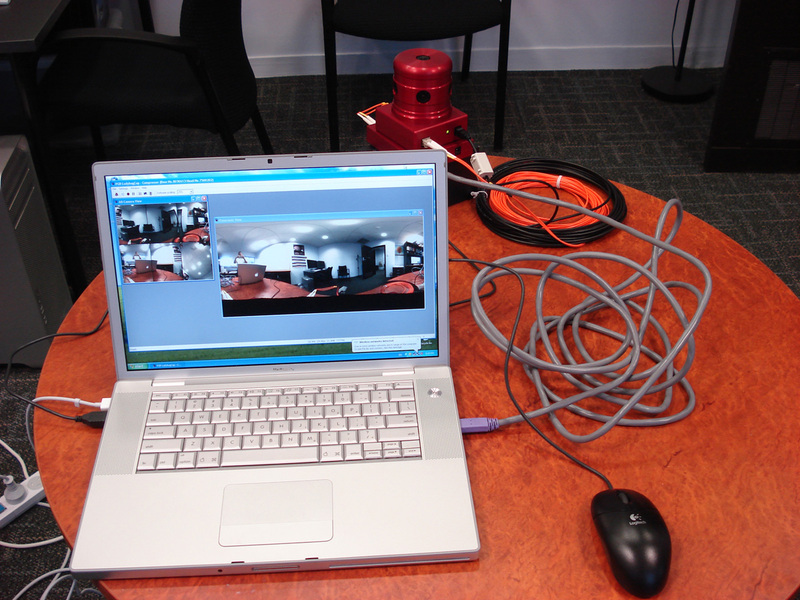 Unlike the LadyBug-2 this is a much more integrated unit with only a single FireWire-800 connection to the computer. 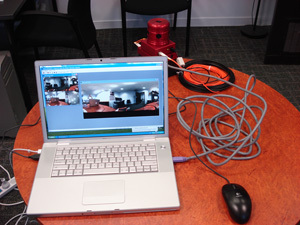 Despite indications in the documentation (which refer to FireWire-800 cards in other computer makes), a current MacBook Pro with it's builtin FireWire-800 power is quite capable of powering and recording from the camera for about 40 minutes just from the Laptop battery. 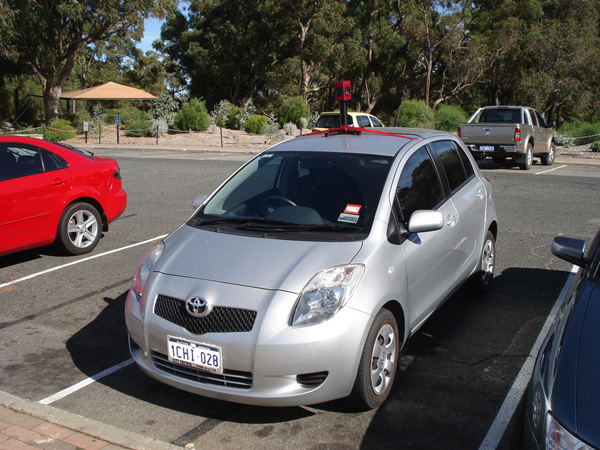 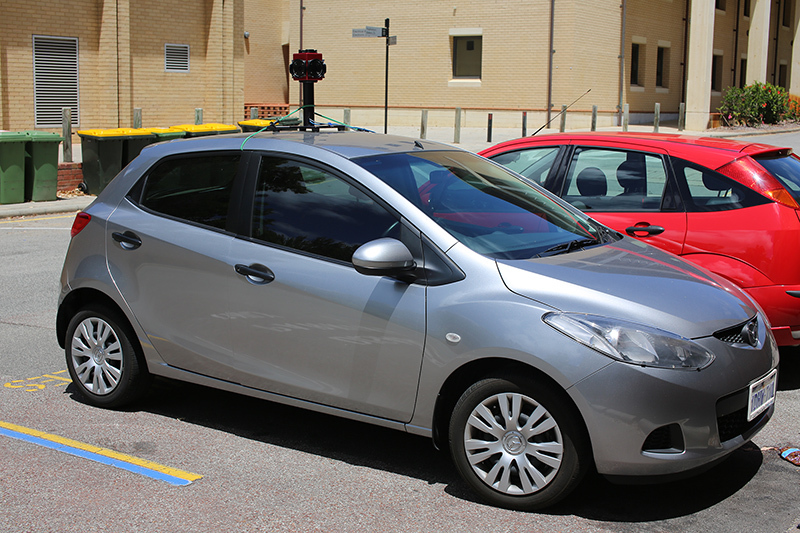 The camera mounted on a Toyota Yaris. 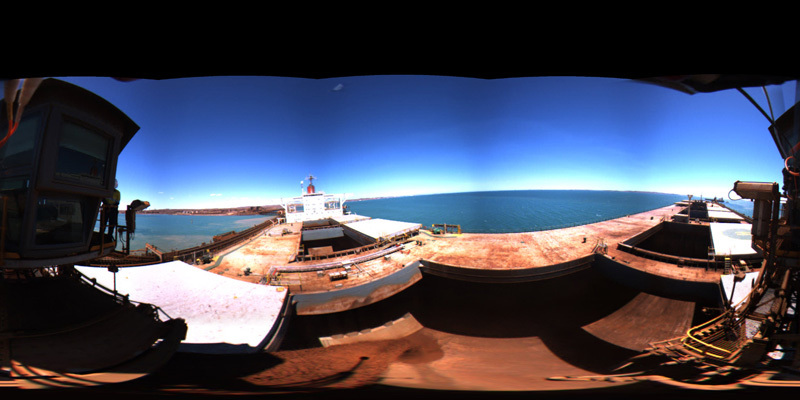 Two sample images, click on image for full resolution. 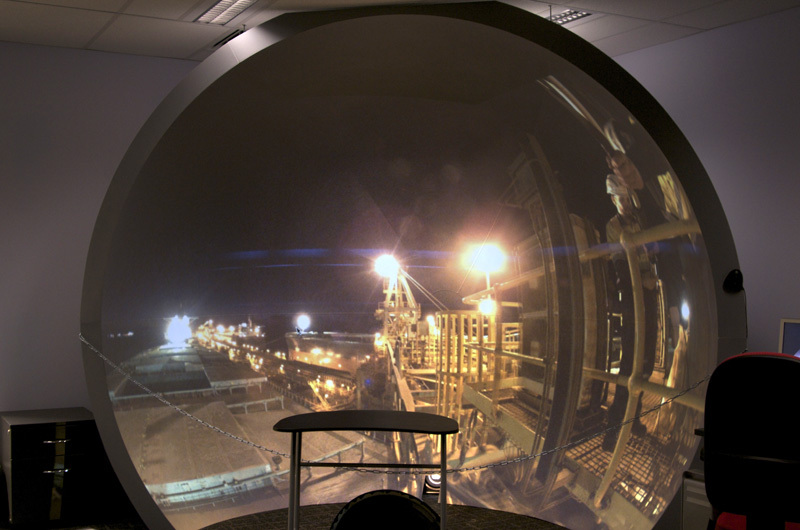 In the iDome these can be viewed interactively, panning around as the movie plays. 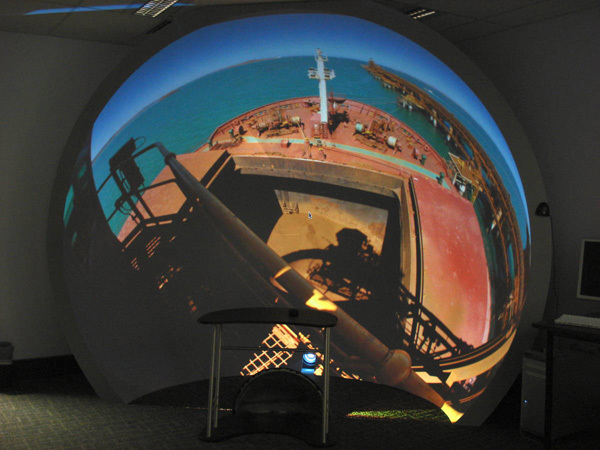 Using software such as sphere2fish arbitrary fisheye projections can be extracted. Two such images are given below for a planetarium dome with a 60 degree tilt followed by two images for a front facing dome. 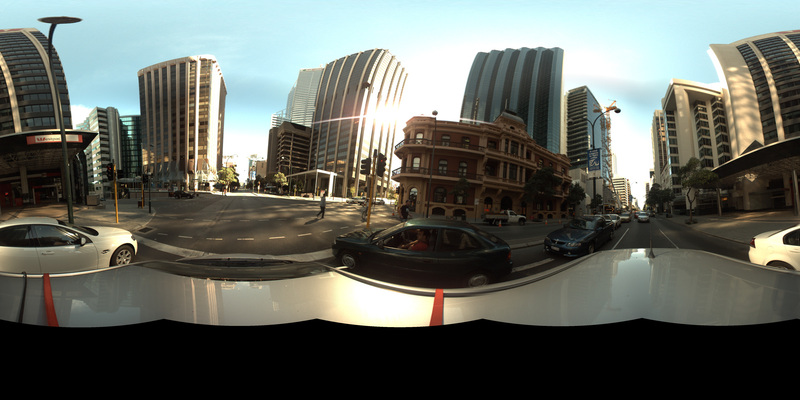 These are of course just single frames from movie sequences. 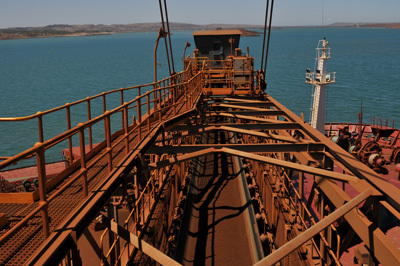 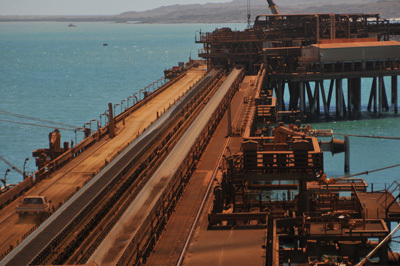 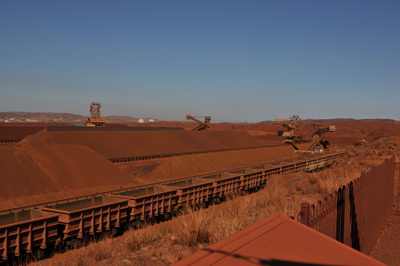 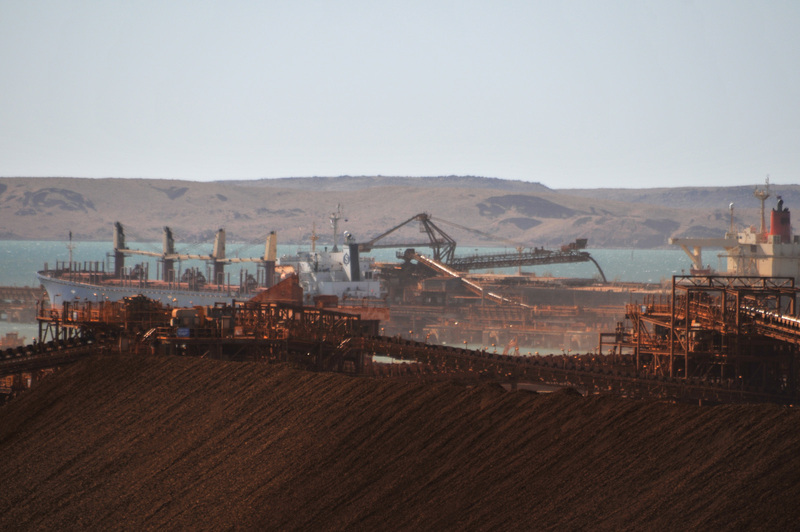 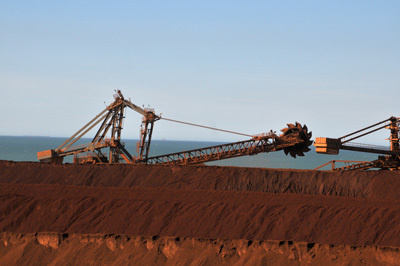 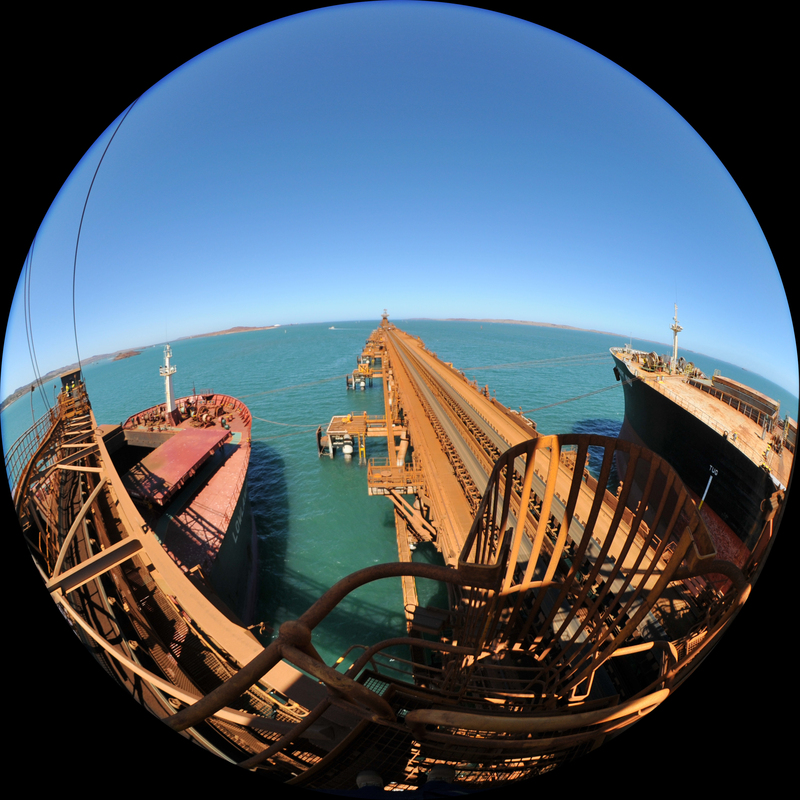 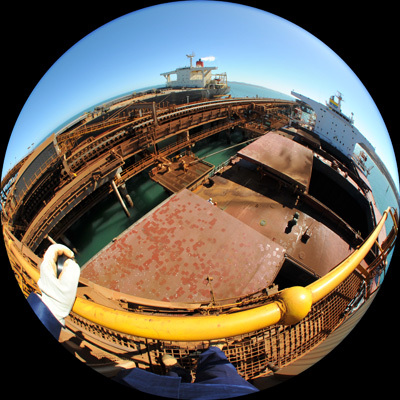 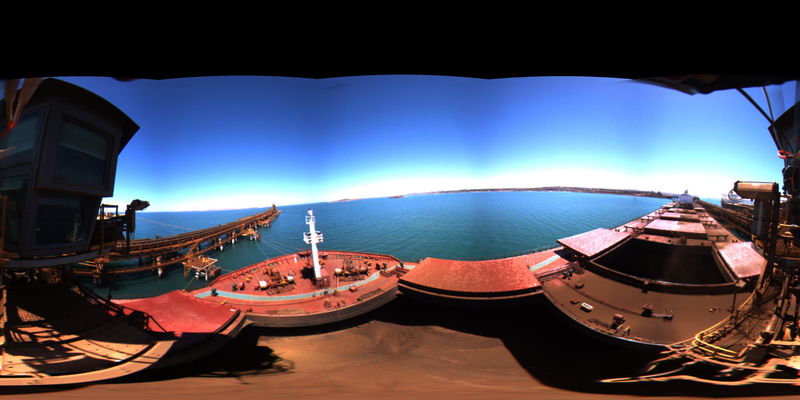 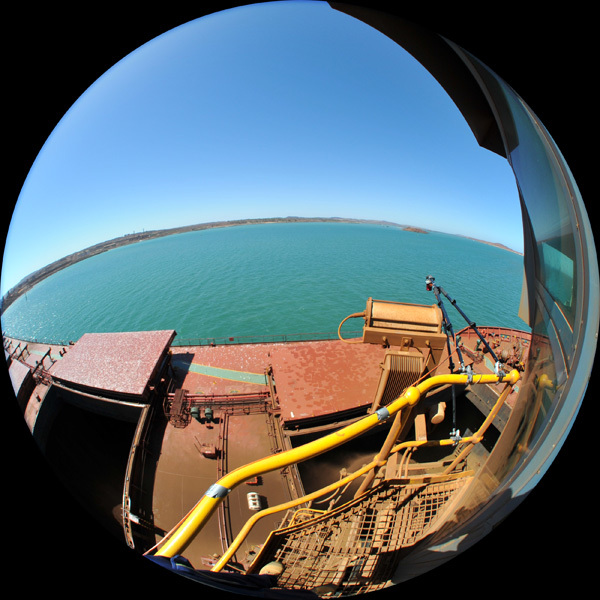 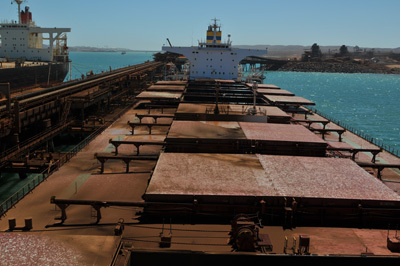 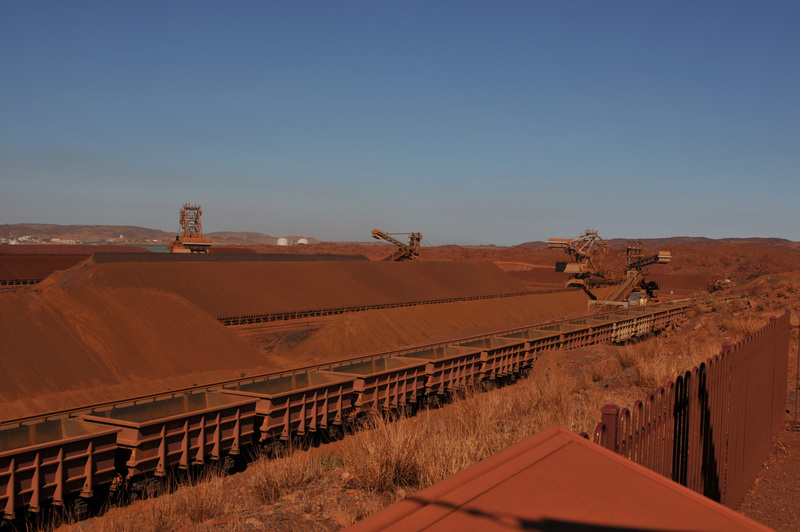 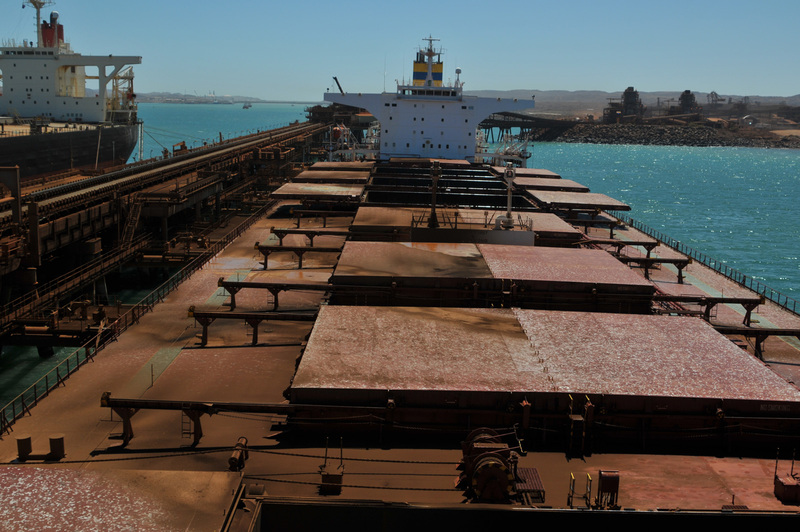 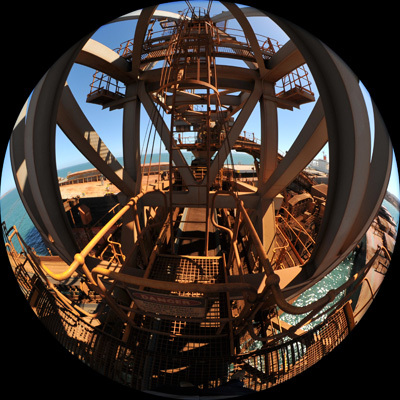 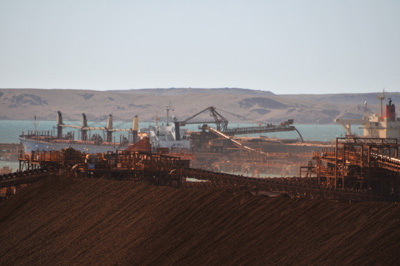 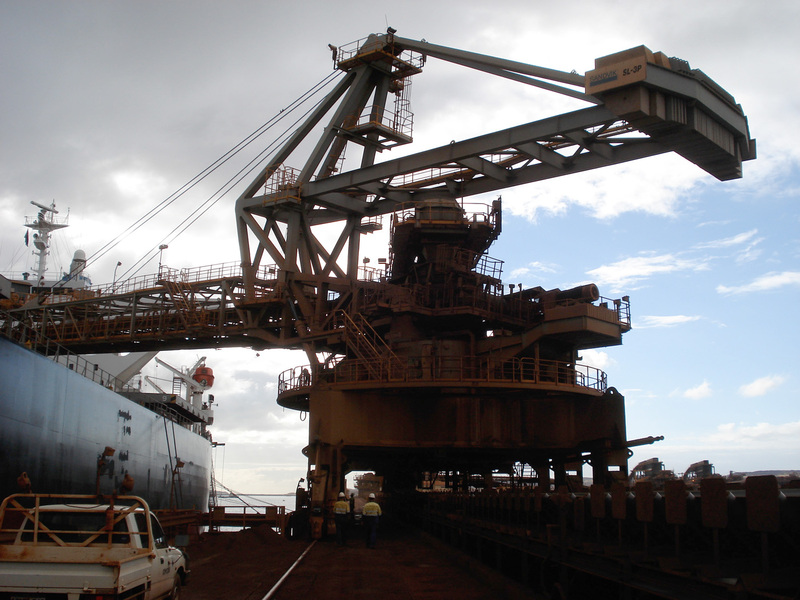 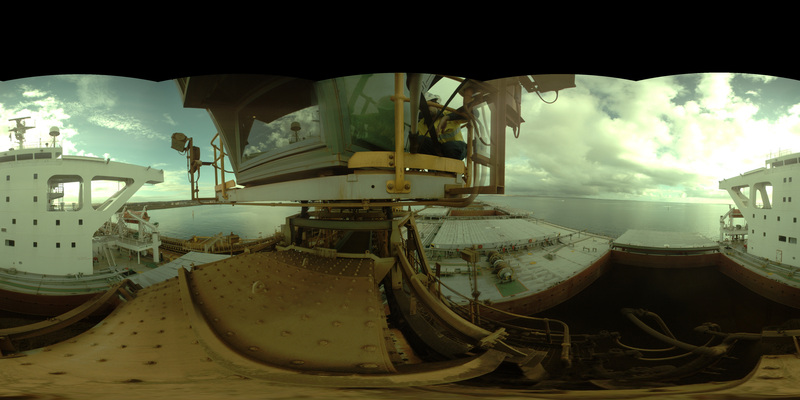 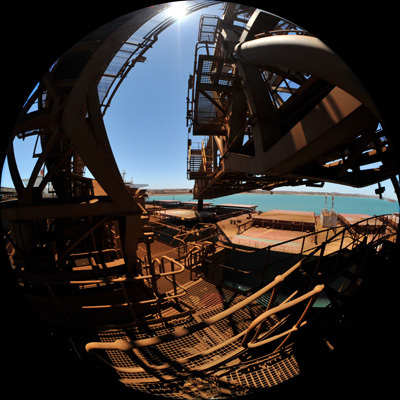 The following image gallery documents a project to record and present 360 degree video of iron ore ship loading at Karratha in West Australia. 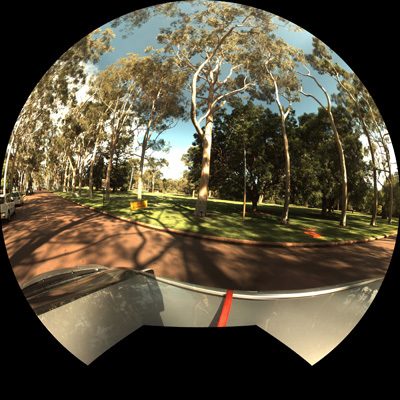 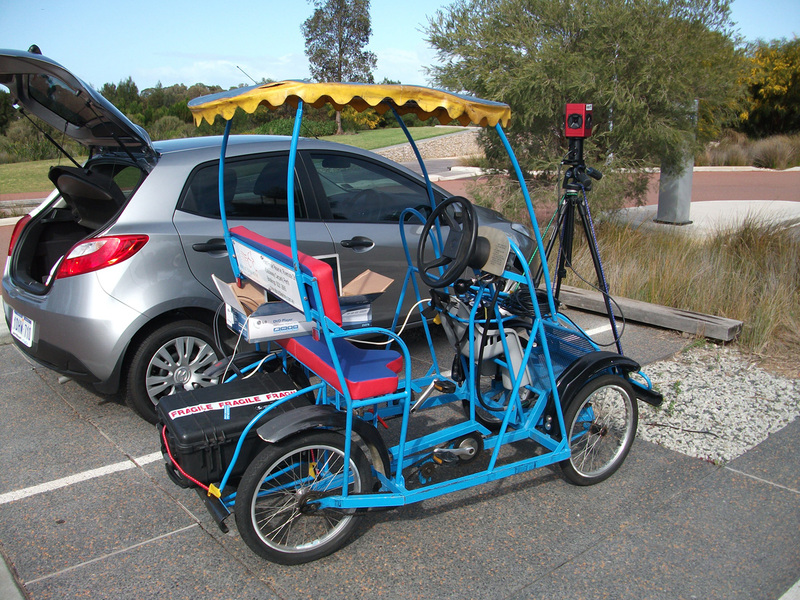 The filming is performed using the LadyBug-2 camera mounted upsidedown, as such it captures 360 horizontally and from about 40 degrees north in latitude to 90 degrees south. 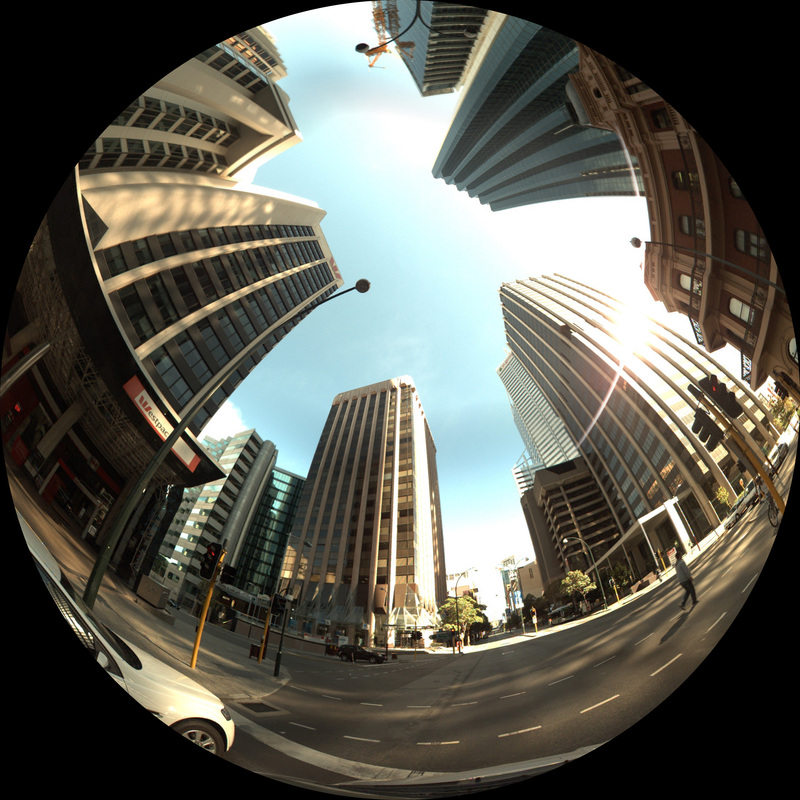 Sample frames from the LadyBug, movies captured at 30fps, each frame is a spherical projection. 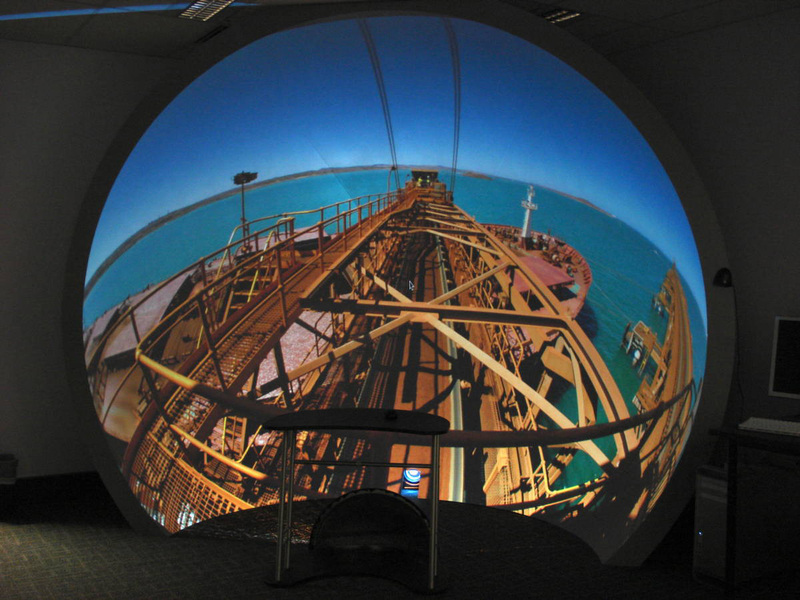 Example QuickTime movie: 1/4 scale. 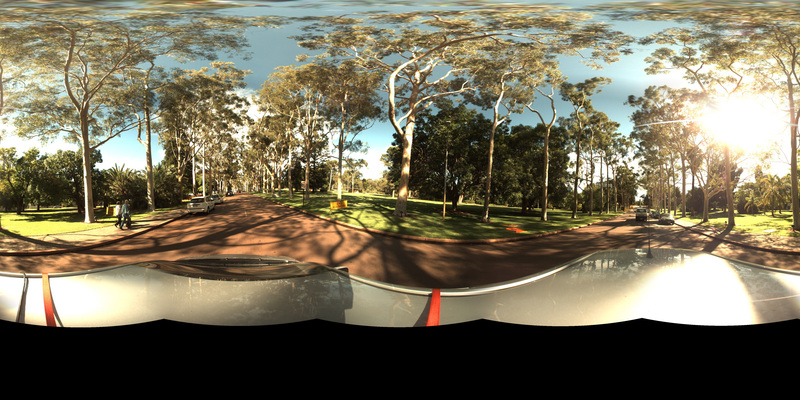 Original frames are 3500 pixels wide by 1750 pixels deep. 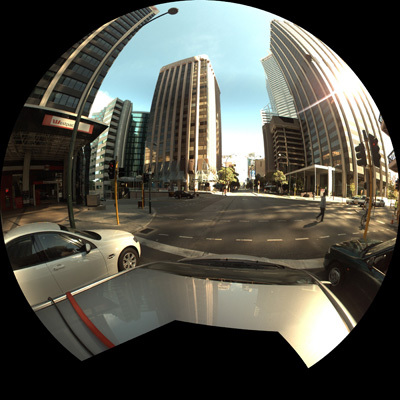 The playback occurs in the iDome, while the iDome only presents a hemispherical view horizontally because the full 360 field of view is captured, the movies can be rotated in realtime allowing the operator to view any part of the loading operation. 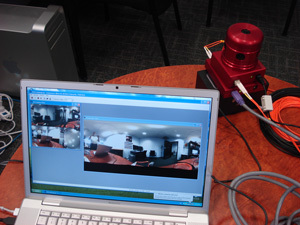 View of the LadyBug-2 camera attached to the end of the control room. 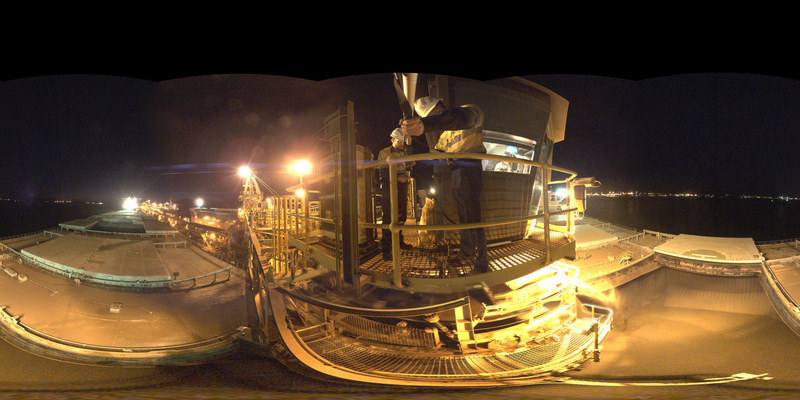 Additional images of the general operation. 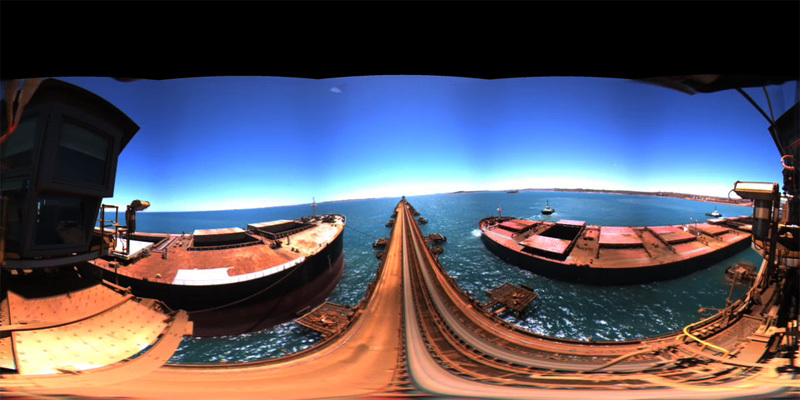 Movie frames captured at 5400 pixels by 2700 pixels at 16 fps.